Valérie Hartzell has been CGO’s Musical Director since January 2017. We are excited that Valérie is working with us, and look forward to a great next stage in the CGO’s development. She has taken over from Peter Rueffer, who was our Musical Director for 20 years. 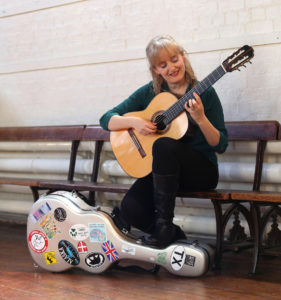 During that time, the CGO has been a prize-winner at the National Guitar Orchestra Competition on several occasions, performed in Paris and in Brussels, and organised an international guitar orchestra weekend in Cambridge.